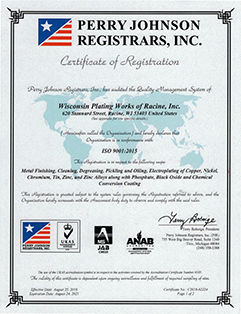 One of Wisconsin's first metal finishing shops to become ISO certified! We are committed to meeting our customer quality, delivery, and special service requirements and the continual improvement of the quality management system. This is achieved by ensuring our quality objectives are met. This policy and these objectives are understood by all employees. We are proud of our record of action and initiatives in these areas because it’s the right thing to do to make this world a better and healthier place for all of our families. The Owners and Employees of Wisconsin Plating Works are committed to meeting our customer quality, delivery, and special service requirements and the continual improvement of the quality management system. This is achieved by ensuring our quality objectives are met. This policy and these objectives are understood by all employees. 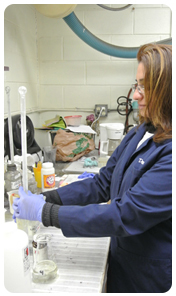 As we continue to grow our company in the 21st Century, Wisconsin Plating continues to improve our stance on quality. One of Wisconsin’s first metal finishing job shops to become ISO certified. In addition we have implemented lean manufacturing initiatives, instituted a metrics program offering enhanced productivity, and make continuous improvements in all areas of our operations. Our laboratory, inspection facility, trained personnel, and commitment to continuous improvement ensure that stringent quality standards are maintained and customer specifications are followed for all orders.